France and Algeria have a long, disgruntled history with each other. The first major contact was made between the two countries in 1526. At the time, Algeria was still part of the Ottoman Empire.Various conflicts ensued between the two for the next few centuries. This brings us to 1830 when France decided to invade the country in order to set up a colony there. The take-over was fairly quick and relatively painless, though the settling that followed was not. As in many colonies, the French forcibly took land from the native Algerians. Slowly but surely, Algeria came under France’s power, despite a relatively small number of people living there actually being French. The native people of Algeria grew poor, and tensions between them and the French settlers were high. In 1954, there were nine million Algerians and one million French people living in Algeria. In contrast, there were just 200,000 Algerians living in France. That year, the National Liberation Front (FLN) rallied for the liberation of Algeria, starting the Algerian War. Life for Algerians in France deteriorated over the next few years. Earlier that year, the Crisis of May 1958 took place which saw the reinstatement of Charles de Gaulle to power. De Gaulle called for a new constitution and gave all of the French colonies the option to vote for the new constitution, or to become independent. Unfortunately for Algeria, they weren’t considered a colony but “three departments” and they weren’t given a choice. As to the war, de Gaulle called for a “peace of braves,” which basically meant he wanted the Algerians to surrender peacefully. The Algerians didn’t heed his request. Many had been working with the FLN to take money out of France to Algeria to fund the Algerian war effort. Supporters of the FLN were routinely rounded up. Also, August saw the murder of three French policemen by Algerian terrorists. But Papon and the police didn’t stop there. Rumours of torture abounded. People were being taken in based on their appearances, arrested for simply being Algerian, and thrown into the Seine with their hands tied behind their backs before being left to drown. Often, the person’s origin wasn’t even double-checked, meaning other North Africans and even Italians were falsely accused of being Algerian based on the colour of their skin. 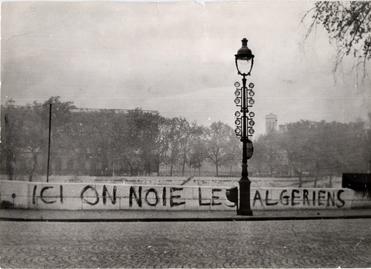 On October 5, 1961, the police announced a curfew that would be put into effect for all Algerians and French Muslims. Between the hours of 8:30 p.m. and 5:30 a.m., they were not allowed out of their homes. In response, the FLN declared that a protest would take place on October 17. Papon was ready. With an enormous force of 7000 policemen and 1400 riot police at his back, he succeeded in blocking off public transport into the city. However, thirty to forty thousand people still managed to make it into the city for the demonstration. Of those, 11,000 were arrested. The demonstration remained peaceful on the Algerians’ side. They were simply trying to protest the unfair treatment they were receiving as well as their discontent with the war in Algeria. However, the police soon opened fire on the crowd. The exact number of deaths is unclear; Papon claimed only two people were killed; the French government admitted some years later that the number was as high as 40. Evidence suggests those numbers were both low. Bodies were dumped in the Seine, meaning it’s likely that many were never recovered. What happened on 17 October 1961 and in the following days against the peaceful demonstrators, on which no weapons were found, morally forces us to bring our testimony and to alert public opinion… All guilty people must be punished. Papon acted as though he knew he would face no consequences, and he didn’t—at least not for this. He even was awarded the French Legion of Honour the same year as the massacre. The French government covered the massacre up, with Papon playing a role in that. The cover-up was also helped along by another well-publicized event shortly after- the deaths of eight communists who were also killed by police outside of the Charonne metro station. People remembered Charonne, but most quickly forgot about the carnage that happened on October 17. Algeria did gain its independence the next year. Later, Papon’s crimes were highlighted during an unrelated trial, resulting in the government finally acknowledging the massacre in 2012, though they only cited 40 deaths. Most historians, such as one of the leading experts on the massacre, Jean-Luc Einaudi, think the number was at least 48 on the night in question and another 142 around the time, including a confirmed 110 whose bodies that were found in the Seine. On Oct. 17, 1961, Algerians who were protesting for independence were killed in a bloody repression. Besides his conduct in this massacre, which only partially came to light during his lifetime, the French Legion of Honour recipient Maurice Papon was later stripped of all such awards and imprisoned when his activities during the Nazi rule of France came to light, such as his collaboration with the Nazis on tracking down and removing Jews from France (of which 1,690 were removed under his watch). He even at one point was involved in organizing the trains to send the Jews off to the concentration camps. Besides that, he was directly involved in selling off the assets of a portion of the deported Jews. When these actions came to light, he sued many of the descendents of the Jews he’d helped deport for, what he claimed, was defamation. Not surprisingly, he lost those suits. Once it became clear the Germans were going to lose WWII, Papon switched sides and started helping the French resistance. Papon was forced to resign his position with the French police due to later abuses of his power in the mid-1960s, again separate from this massacre which he’d helped cover up, such as his theorized involvement in the disappearance of the leader of the Tricontinental Conference in 1965, Mehdi Ben Barka. It is thought that the police killed him. That said, Papon went on to hold a few different government offices including Minister of the Budget, before his WWII exploits started coming to light in 1981. Reminds me of the genocide claims by Turkey against the Armenians, which to this day the Government of Turkey denies and the movie Ararat.